SkyLight Premium roof windows are a new development on the roof window market, the quality of which is supported by the experience and dynamic growth of one of the biggest PVC window and door companies in Poland. Dobroplast roof windows can be mounted in any conditions, being especially suitable for rooms of increased humidity. They do not require maintenance and are easy to use. They are characterized by good thermal and sound insulation parameters as well as air-tightness. the window’s thermal transmittance is Uw =1,4 [W/m2K]. Sealing flashings are an integral part of a roof window correctly mounted in the roofing. They secure and seal them against weather conditions, ensuring rain- and post-snow water removal as well as provide protection against wind. The flashings are made of aluminium plate, just as the window cladding in RAL colours – standard 8019 and non-standard 7043. 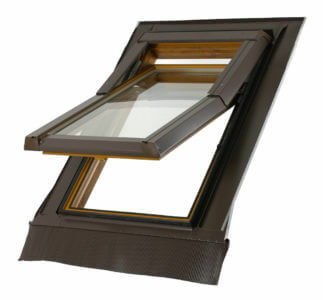 A relevant advantage of the Skylight roof window sealing flashings is the innovative way in which they are connected with the frame. Thanks to placing the flashing’s upper rim in a special groove in the frame and covering the fitting with a gasket, we eliminate the risk of any kind of water leakage, especially one caused by melting snow. Flashings for tile roofing enable placing the window inside a profiled roof surface. Thanks to an elastic component, the lower flashing unit (1), it is possible to thoroughly seal the flashing and to transfer water from the flashing onto the roof’s surface. The numbers of flashing components correspond to the assembly sequence. The P flashing allows for an air-tight fitting of the window inside roofings such as cardboard roofing or roofing shingles. The flashing’s lower unit does not include an elastic component. 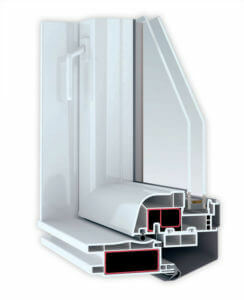 Modular flashings enable fitting windows into groups: – mounted horizontally and/or vertically. In the case of joined windows, it is necessary to state, before placing the order, the rafters’ width between the particular windows so that the windows can be optimally arranged within the roof trusses. We believe that only satisfied and happy clients are a testimony to a company's good reputation.